Recently we created some new research on the efficacy of issuer refunding policies. After implementing a new and powerful market model that allowed us to capture refundings with greater fidelity than ever before, we decided to test real-world refunding criteria and see which ones actually maximized expected present value (EPV) savings. Of course, any prospective refunding analysis in part depends on an interest rate view. If your rate model is static and goes to 50% tomorrow and stays there for the next 30 years, any criteria that has you refund every bond with a $1 of pv savings today will be the best policy around. You can download the full research here (Fig 12 on pg 17 for the summary table punch line). Once we looked at refunding guidelines currently in use, we decided to test different combinations of criteria issuers have not used in order to find a best single refunding policy, as measured by greatest EPV savings. Eventually we used an optimization algorithm (see graph below) to determine the best solution parameter; one of the benefits of using a comprehensive model. Under the bright light of empirical performance we found that the combination of a simple PV savings threshold plus a basic sensitivity calculation trounced every other refunding policy in use today – including all the (unnecessarily complicated) varieties of refunding “efficiency” people throw around. We dubbed this uber-savings generator the Alternative Policy. The Alternative performed so well we first didn’t believe it. Was there some mistake? Did we miss a minus sign? Did we have an over-specified solution that wouldn’t work in practice? We decided to do a second piece of research backtesting the Alternative Policy and all the others using actual historical muni yields dating back to 1964 (thanks Delphis Hanover and Austin Tobin). Summary results are on Tables 6 and 7 but the bottom line: the Alternative Policy is real. It crushed the other tested policies in every period for both premium and par bonds except in a couple of 2 year periods in the 70s with the most rapid yield increases. In fact, the Alternative's measured outperformance was more dramatic historically than it was in the initial simulation-based research. 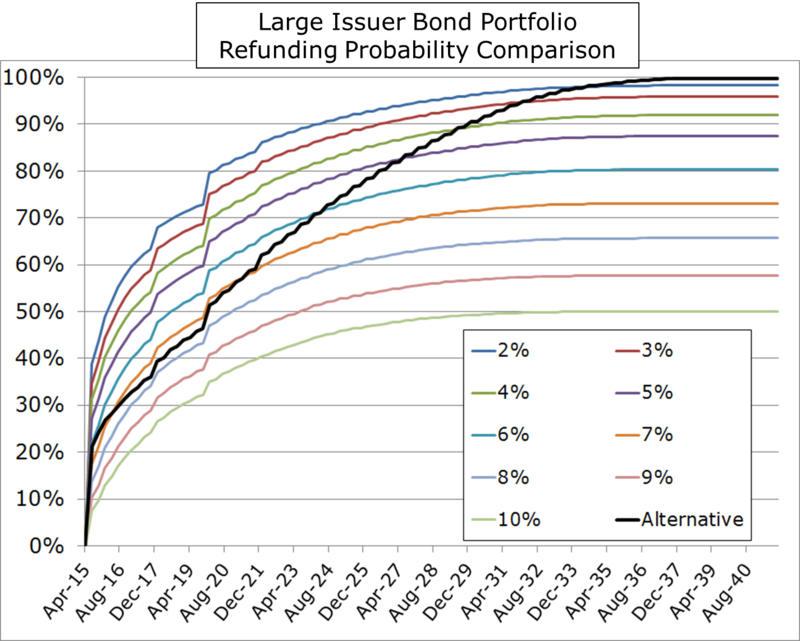 We recently ran some refunding probability numbers for a whole portfolio of issuer bonds comparing a variety of different PV savings thresholds with the Alternative Policy. Results are shown in the graph below. Substantively all of the PV savings thresholds look very similar. Naturally the lowest PV thresholds lead to the highest overall probabalities of refunding. Note you can see the call dates for clusters of bonds as vertical blips in refunding activity; when the drag of negative arbitrage drops away, higher PV savings occurs triggering refunding activity and a bump up in refunding probability. For all of the PV savings criteria, bonds are refunded with increasing probability until a flat line is reached where the bar is just too high and no more bonds are taken out. And this pattern is something we saw in our research for all refunding policies including all manner of elaborate decision criteria including every variety of refunding efficiency we could think of. That is, for all refunding policies except the Alternative. 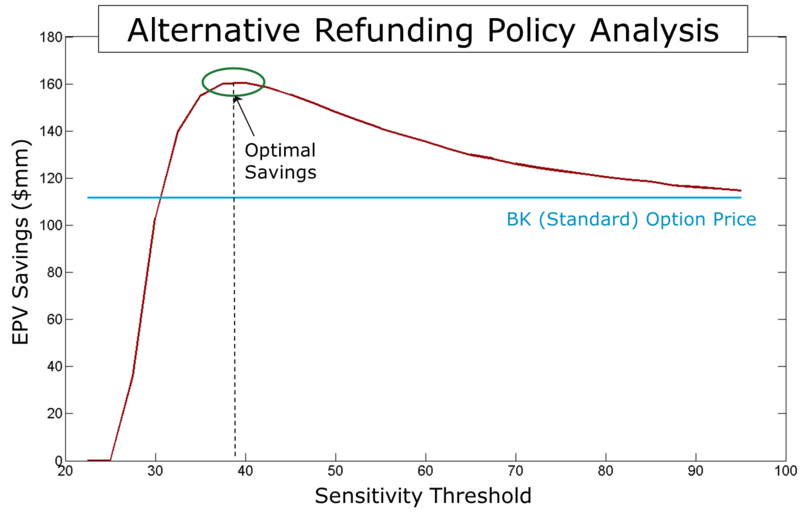 As you can see, the Alternative policy starts out at a PV savings equivalent threshold that looks to be between 7 or 8% but over time the effective PV equivalent falls (i.e. the black line rises) as the remaining life of the callable bonds declines. Note that the Alternative is the only policy that ultimately gets to 100% refunding across all callable bonds in this portfolio. I'm reluctant to use this word to describe a very simple hueristic but for this purpose, the Alternative simply exhibits more intelligence than all of the other refunding policies. And as a result it does a better job maximizing expected present value savings relative to every other refunding policy we've seen. Though we issue this challenge: if you think you've got a better performing refunding policy that we have not tested, send it to us and we'll take a look. Yes, it is a bit anticlimactic. It's a simple hueristic but actually every refunding policy is a simple hueristic. Some just work emperically a lot better than others. And that's why the concept of "efficiency" as it relates to refundings is so cognitively dissonant to me. "Efficiency" implies there's some perfect, market-timing ideal against which every decision is benchmarked and towards which we all should strive. When it comes to refunding timing, this is nonsense. If only it were that simple. But more on that in a future article. Who will be the first issuer to put this in practice? Some are moving in that direction. As this excellent TED talk points out, to start a movement – it takes two. ps And sorry MAs. I think we may have just triggered your fiduciary obligation so better go back and read that research thoroughly!